On Sept 9 - 10, I was able to meet in person with Avanade's Toby Velte, as a follow up to my post, Avanade's Anti-Greenwashing Initiative, Part 1. Toby was nice enough to give me the first copy of his book, but then we met with Christian Belady and we gave him the first copy as it seemed appropriate given Christian's contribution to power and cooling efficiency in the data center and IT equipment. As we discussed Toby's book, it reminded me to go Green requires a network of expertise. To go Green requires a learning mindset where you you can compare what you are doing vs. others, and integrate ideas that work given your environment. 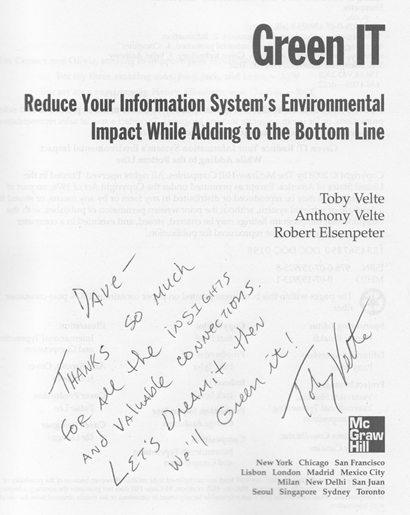 Toby's book gives you a high level overview of the network of information you will need for a Green IT/Green Data center initiative. Many of the ideas will be ones you've heard before, but some will be new. I don't know of any other source I could point at to help people see the holistic set of issues they face in going Green. Meeting people like Toby is what makes this Green Data Center area so interesting, and I am having more fun than I have had in a long time. Oh, I did my own copy of Toby's book and Toby signed my copy. I like Toby's new tag line. "Let's DreamIT, then we'll GreenIT!" You can order Toby's book here. Part 3 on Avanade Green IT will be coming up when I meet with Avanade's Stephen Fink at Data Center Dynamics Chicago on Sept 16.